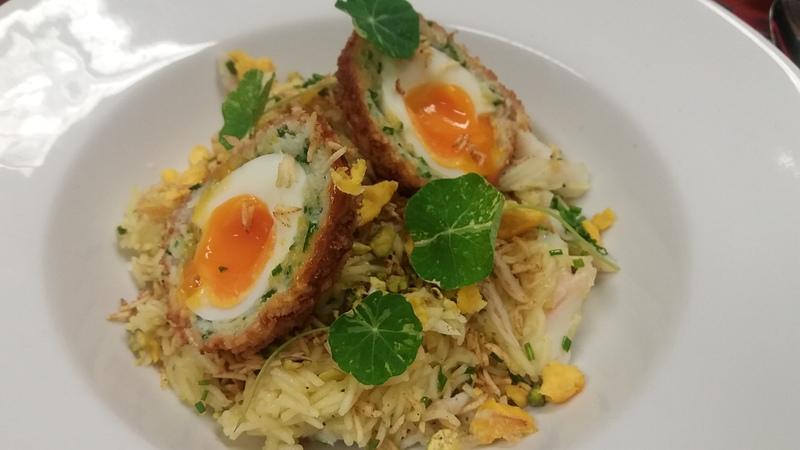 This game-changing kedgeree is topped with a homemade smoked-haddock scotch egg. It requires an audience worthy of your dedication and love! Begin with the cured egg yolk: Place the egg yolk on a tray lined with baking parchment, sprinkle with the sea salt, and allow to dry out at about 70C for 2 hours or until the yolk is completely firm. You should be able to make shavings using a cheese grater. For the Scotch egg: Bring a pan of water to a gentle boil, cook one of the eggs for 5 minutes, then place in ice water to cool. Peel carefully and set aside on kitchen paper to remove excess moisture. Place half the raw smoked haddock in a food processor with a splash of lemon juice, salt to season and the chopped chives. Pulsate to form a paste. Press the paste between your hands to roughly 3mm thickness and then wrap this around the soft boiled egg. Mix the cooked rice with the breadcrumbs, and pane the Scotch egg using the other egg and the flour. This is ready to deep fry later. For the kedgeree: Using a frying pan, gently cook the diced shallot in the vegetable oil without colour with the cumin seeds. Add the spices, and continue to cook for about a minute stirring occasionally with a wooden spoon. Now add the rice, giving a good stir with the wooden spoon to incorporate all the flavour. Add the chicken stock and cover with water. Allow to simmer for about 12-15 minutes until the rice is fluffy. Add a little more water if needed. Meanwhile, steam the remaining half of the smoked haddock for about 5-6 minutes. Once cooked, season with a little salt and the remaining lemon juice. Then flake the fish into the rice. To plate: Deep fry the Scotch egg for around 3-4 minutes until golden. As the haddock around the egg is so thin, it will not need to go in the oven, keeping the yolk runny. Allow to rest while plating the dish. Spoon the kedgeree into a warm pasta bowl. Scatter the deep fried rice and pistachios on top, followed by the shavings of cured egg yolk. Slice the Scotch egg in half, and place on top of the kedgeree with runny yolks facing you. Finish with 3 nasturtium leaves.